Sometimes lessons take a direction we didn't expect. In this post I'm going to describe a short, off-the-cuff writing exercise that I did some time ago with a group of teenager students. I had been running a workshop with some teachers at a local school, so a colleague took my classes for me. She had a lesson to teach and homework to set. I was very sceptical about the homework being done. It's bad enough when I set it, but even worse when the kids think they're never going to see the teacher who set it again. I wanted to make a point, that homework is homework, whoever sets it; that we teachers work together, collaborate, know what's going on, even when we're not there; that lessons are planned and homework's all part of the big picture. I wanted to do it so that the students feel we care, but also so they know that we are checking up on them. Quite a few birds to kill with one stone! If NOT please give me a VERY GOOD excuse! The students come in in dribs and drabs and, as they did, I pointed them to the question. They looked sheepish and mumbled, but I said no, no, give me an excuse, a good one, and I handed out a slip of paper. I'm collecting excuses, I said, they can be true, they can be false, but they've got to be good. 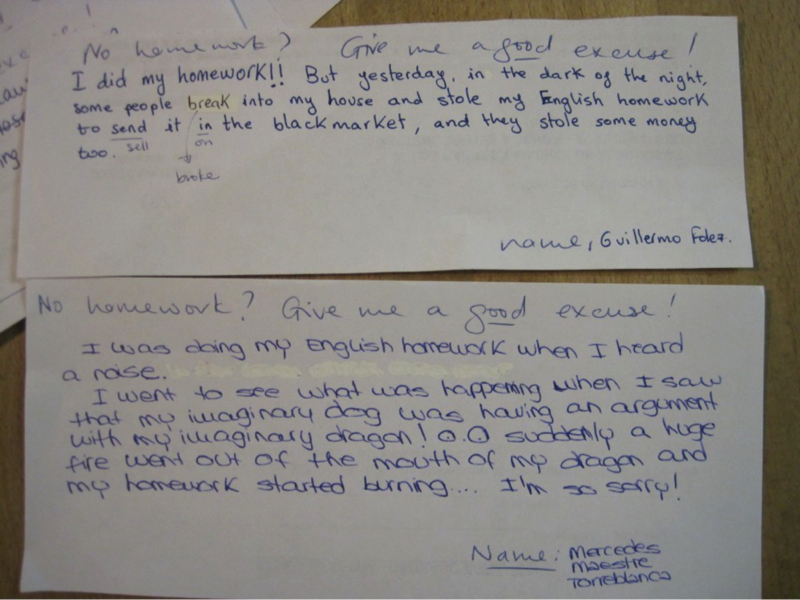 I shared it with the class, commented on how classical it was, asked them if they thought any dog had actually ever eaten any homework in the history of homework excuses. The excuses got more creative - or at least more honest. Students called me over to help them get it right. As latecomers arrived their classmates called out to me to give them slips of paper. Their enthusiasm got contagious. 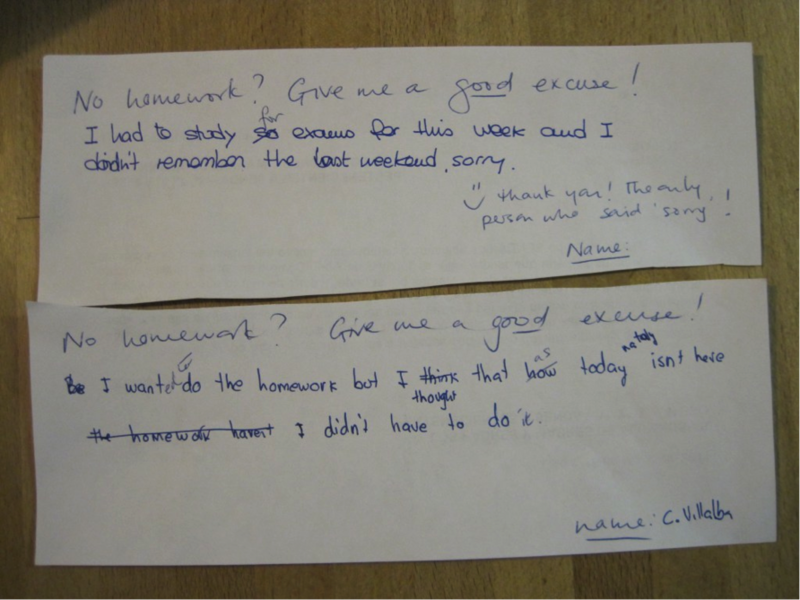 I told them I was going to collect the excuses and use them as a basis for a lesson with another group. The excuses came thick and fast, their attention was focused and they listened carefully and quietly as I read out each new excuse, asked each other what their excuses were, elaborated, tippexed (! ), checked and changed. What had been a complete throwaway opener - a quick reminder about homework duties - turned into a focused, focusing, engaging writing game. They worked so well for the rest of the class as well; applied, involved, participating. I tried the same thing with my second class. Same reaction. I typed up all the excuses from the two classes. I gave them to the other class in the next lesson and got them to vote on them in different categories ( most original, most sincere, most hackeneyed). I think they appreciated the fact that I appreciated the time and energy and enthusiasm they had put into it. Once my daughter's French homework WAS eaten by our new puppy. We took pictures of the offender with the papers and she wrote her excuse in French. It can and did happen! Hilarious! I typed up the last activity (see above) and showed it to students on the IWB. They then had to write their own, of a similar length. They then showed it/checked it with a friend. then dictated it to me live on to the IWB (my mac connected to the IWB). They could correct their own work as I was typing up the next one. They loved sharing wild ideas, and writing a mini story for a change!